In this post I explained how the Normalized Cut works and demonstrated some examples of it. This post aims to take a closer look at the code. I ran the following code to monitor the time taken by NCut with respect to initial number of regions. Here is the output sequentially. By a little guess-work, I figured that the curve approximately varies as x^2.2. For 800 nodes, the time taken is around 35 seconds. I used line profiler to examine the time taken by each line of code in threshold_normalized. Here are the results. 220                                               """Perform Normalized Graph cut on the Region Adjacency Graph. 223                                               yields a cut greather than `thresh` or such a cut cannot be computed. 230                                                   The array of labels. 232                                                   The region adjacency graph. 235                                                   value of the N-cut exceeds `thresh`. 237                                                   The number or N-cuts to perform before determining the optimal one. 255                                                   # Pick second smallest eigenvector. 271                                               # The N-cut wasn't small enough, or could not be computed. 272                                               # The remaining graph is a region. 274                                               # `labels` are unique, `new_label` is also unique. As you can see above 95% of the time is taken by the call to eigsh. To take a closer look at it, I plotted time while ensuring only one iteration. This commit here takes care of it. Also, I changed the eigsh call to look for the largest eigenvectors instead of the smallest ones, with this commit here. Here are the results. A single eignenvalue computation is bounded by O(n^1.5) as mentioned in the original paper. The recursive NCuts are pushing the time required towards more than O(n^2).eigsh solves the eigenvalue problem for a symmetric hermitian matrix. It in turn relies on a library called ARPack. As documented here ARPack isn’t very good at finding the smallest eigenvectors. If the value supplied as the argument k is too small, we get the ArpackNoConvergence Exception. As seen from the above plot, finding the largest eigenvectors is much more efficient using the eigsh function. 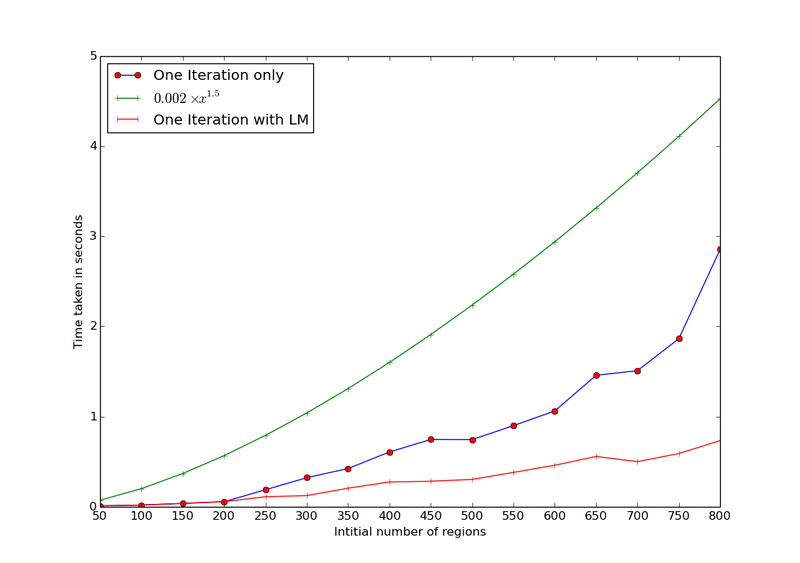 Since the problem is specific to ARPack, using other libraries might lead to faster computation. slepc4py is one such BSD licensed library. The possibility of optionally importing slec4py should be certainly explored in the near future. Also, we can optionally ask the user for a function to solve the eigenvalue problem, so that he can use a matrix library of his choice if he/she so desires. Although the current Normalized Cut implementation takes more than quadratic time, the preceding over segmentation method does most of the heavy lifting. 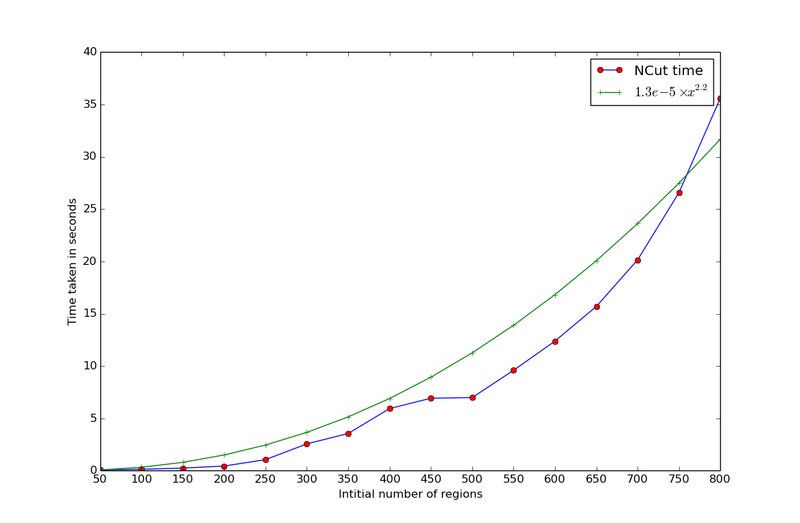 With something like SLIC, we can be sure of the number of nodes irrespective of the input image size. Although, a better eigenvalue finding technique for smallest eigenvectors would immensely improve its performance.